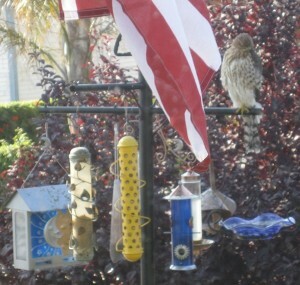 A customer in California sent in this photo shortly after receiving the wild bird feeders she had ordered. 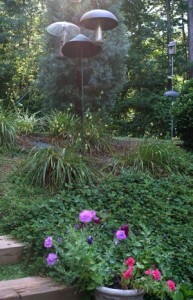 The two blue celestial theme bird feeders, yellow peanut feeder, and blue wavy birdbath are from us… the hawk was not! 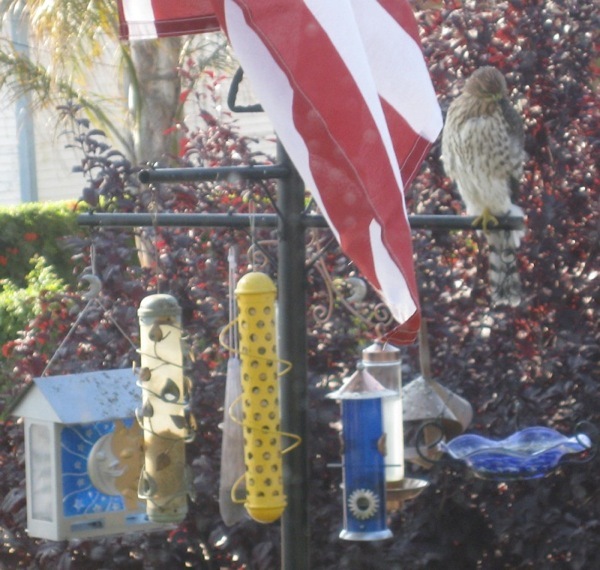 Vickie snapped this photo from inside her living room, but by the looks of the flag waving right in front of him, this Cooper’s Hawk would’ve likely been unfazed by any photo op! A friend recently posted on Facebook too: “To feed or not to feed?” After he witnessed multiple accounts of a Sharp-Shinned Hawk picking off doves around his wild bird feeders. 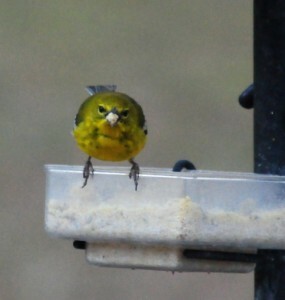 And me too, on one of the list-serves I recently inquired about hawks at around my feeders. A few precautions and solutions were offered. One of them was to hang wild bird feeders from the interior limbs of trees. The outer limbs will act as a barrier for hawk attacks. 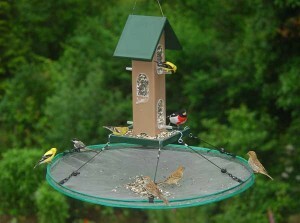 The person also said he likes feeding various sparrows and other ground-feeding birds. To protect them from hawks (and cats) he uses tomato cages laid flat on the ground. 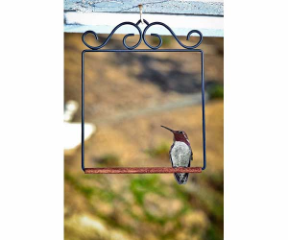 This gives the birds many entry and exit choices, while keeping them safe from predators. 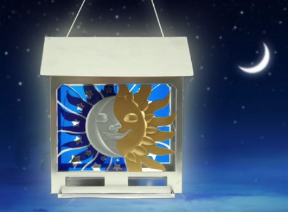 Oh yeah, and that cobalt celestial-looking wild bird feeder is actually called “Solstice”. 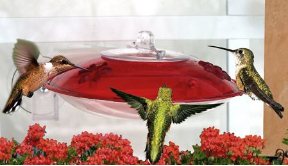 It’s a cool hopper style feeder with large capacity and innovative perches, measuring 13 tall x 11 wide x 7.5 deep. 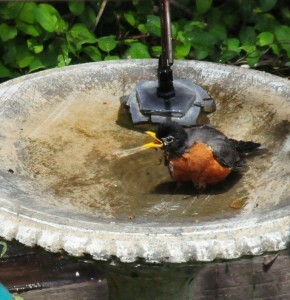 It promises to entice feathered friends and keep them coming back. 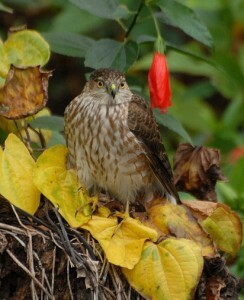 But should you see hawks around your yard, do the birds a favor and move it to a tree! 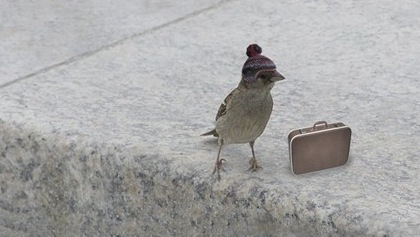 Some “birder” folks in big cities face a challenge when it comes to attracting desirable songbirds. It seems an unwelcome, furry rodent type, better known as the rat-is usually attracted to fallen seed and ground waste. But by no means do you have to abandon the birds! 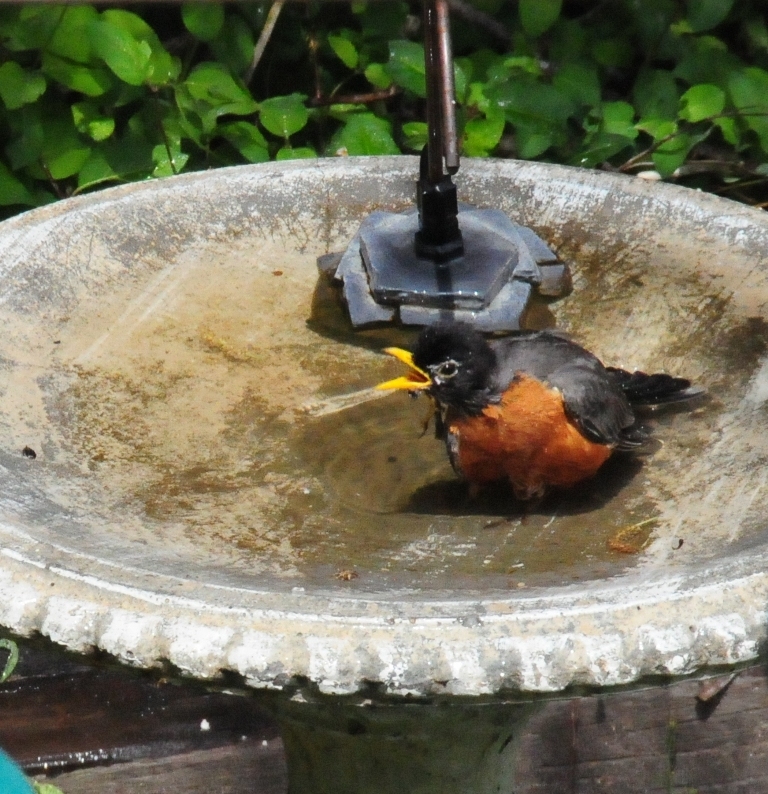 Feeding suet leaves no waste or ground mess, and water in a birdbath are both effective, easy, and economical methods to entice birds. 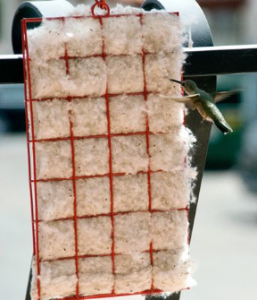 Oh… and let’s not forget birdhouses, because even in the city, birds need roosting spots and nesting cavities. Kelle Frymire faced this dilemma when she moved from the suburbs of Chicago to the big city. 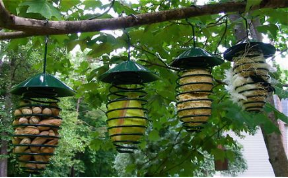 With a suggestion from her long time friend and landscaper, Rocque Emlong, it was decided that decorative bird houses would be used to lure feathered friends. His creative idea spawned an almost magical tale, a display bringing smiles to many people, both young and old! Not just one or two houses… but 20-30 decorative bird houses (that actually look like birds) adorn an ancient oak tree next to Kelle’s house. Hand carved decorative bird houses bring this old oak tree to life, with such character and charm that the neighbors delight, and local kids insist on saying “hi” to the birds on a daily basis! 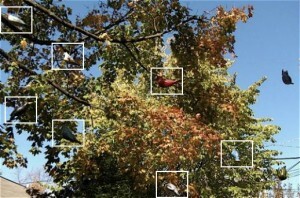 Some of the birdhouses sit suspended in animation between the the tree itself and the residence, using monofilament. The wooden birdhouses provide roosting spots on cold nights, and yes… even nesting cavities in early spring, You can read the full story on this magical creation here. 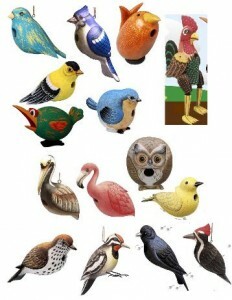 Birdhouses that look like birds? You bet! From Bobbo, Inc, these decorative bird houses are hand carved in Indonesia, using a quick-growth & renewable resource called Albesia wood. 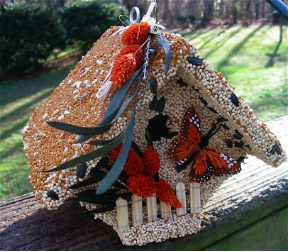 The houses are complete with clean-outs and provide a perfect nest site for your avian amigos… with a very unique character all their own! 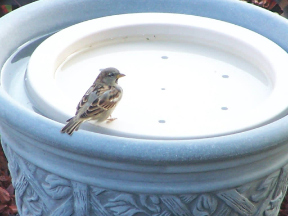 Thanks for housing the birds!